When I was a child, my elementary school had a school carnival one day where they had a circulating river of ducks that floated past, and if you picked one up and got a winning number you won a prize. I think that was the first time I can recall being fascinated by aqueducts. I used to walk at a shopping center called Northwest Plaza and look at the fountains. When I worked in downtown St. Louis, I used to cut through the Wainright Building↗ plaza on my way to lunch when they had their aqueducts working which they later filled with potting soil and plants, to my disappointment. My brother and I had these tiny plastic ships that I think we got at a tourist shop on a road trip in the Midwest, and when it rained we would place these ships on my neighbors brick patio, and the spaces between the bricks would create canals that floated the boats. I was fascinated by buoyancy, and when I was in 4th grade, I did my first science fair project on it, injecting measured volumes of air into chambers until it lifted gram metric weights to the surface, recording the results. My next science fair project was on how gas changes volume with temperature and pressure, submerging balloons under icy water, rediscovering the gas laws. Perhaps it was a traumatic childhood event that made me forever curious at what was beneath the surface, leading me to try to build my own submarine and air tanks when I was a young teen, and later drove me to learn scuba. I once shot a college film underwater at my friend's swimming pool. One of my favorite films at that time was Luc Besson's "The Big Blue". My brother worked at a tropical fish store and would setup huge fish tanks with various pumps, and at one time had a 55 gallon tank for his Oscar, a very intelligent fish, for a fish. While out in a lake in a wobbly aluminum boat with my grandfather, skimming along silently while he used his 12 volt trolling motor, I would envision creating remote controlled boats with submersible sensors that I would lower far down to see what was down there. In cub scouts, I built a wooden regatta. Some kids built catamarans. I built a model WWII submarine and had electric models too. So I new the basics. But back at home, in the suburbs, I used to lower a light into the storm water sewers, to see what was down there, tunnels branching to other tunnels. My brother and I later walked in the larger tunnels. We had to crouch down walking in the dark until we saw sunlight ahead from the next storm drain. We used these tunnels to navigate under the city of Bridgeton, and could make our way all the way downtown. The flow of water is interesting to me. Hydrodynamics has as much to do with the physics of the universe than any field. The Greeks and Persians knew this. Einstein used Ernst Mach's principle in his work on general relativity. Watching water move is like watching fire, the patterns are mesmerizing. So one day in 2011, out of the blue, I decided to build a Ghost Ship display, something that had a carnival-like feel to it. 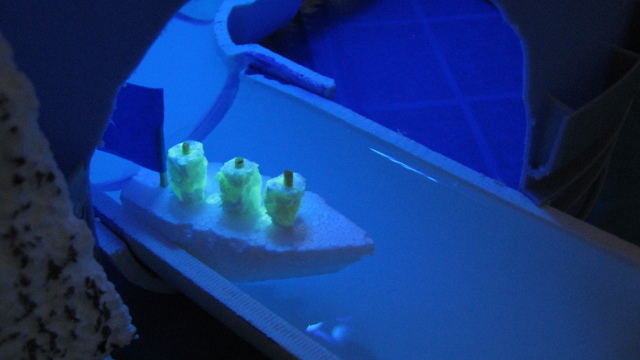 Essentially, these little dark Styrofoam boats float on a powered aqueduct through a cave of black light under a rocky lighthouse, and come out of the cave as eerie green illuminated "ghost ships". If you haven't noticed by now, my interest in Light and Film, Plato's Allegory of the Cave, my interest in lasers, and boats that glow when they come out of a cave, are all similar. Like Graham Hancock's Supernatural, there are mysteries in the dark that can illuminate our minds if we come out. Some say Leonardo da Vinci had such an experience. The pylons in the original Land of the Lost series are kind of like that. I had it running one time for a party, with food and drink on the table around the aqueducts, and people seemed to like it. Each person could make their own flag designs on the painter's tape. As boats would lose control, hit each other, or clump up or get stuck, people would nudge them or help them out. You could see which designs did better than others. To build it, I first bought some lengths of PVC pipe, with some 90 and 45 degree bends, and then used a cordless jigsaw to cut the pipes in half to create the aqueducts, which is is fairly easy. I arranged the bends so that on one side, the aqueducts went to the center like a M shape. I glued the pipes together with PVC pipe joint solvent, but this was not water tight, so I went over each of the seams with clear silicone. Then I took a 5 gallon bucket and cut two holes in the side with the jigsaw and placed it over the center vertex of the M shape. 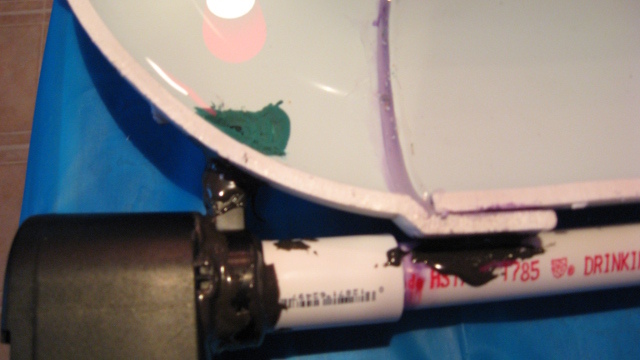 I drilled a hole in the top of the inverted bucket and installed a black light inside the bucket at the top. Any tiny boats passing by the vertex of the M-shaped bend spend more time under the black light than if it was just a straight segment, since the more linear space can fit within the same area if you bend it. This is important, since the more time they are under the light, the more they glow. 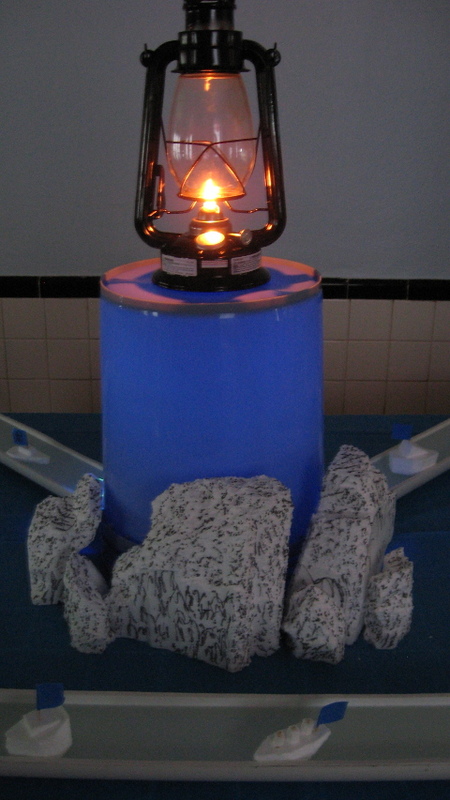 It also allows the "lighthouse" to be in the middle of the table, instead of hanging off the edge. 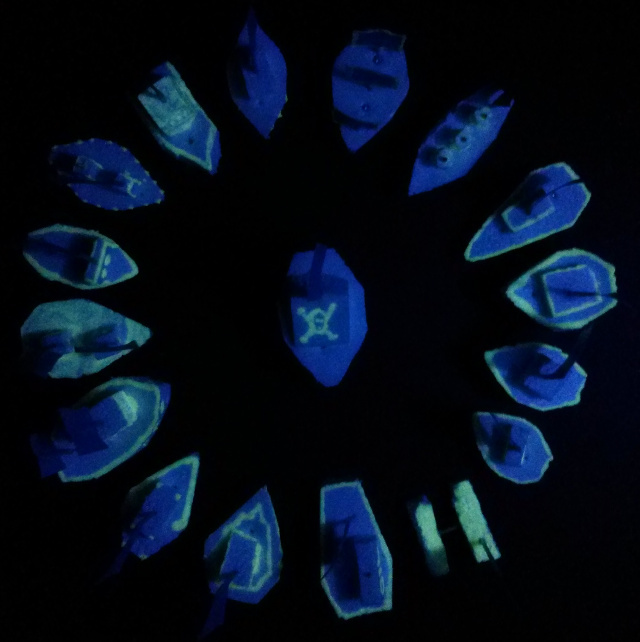 To make them glow, each Styrofoam boat was painted with glow-in-the-dark fabric paint. Tiny metal bbs were pressed into the bottom of the boats so they stayed upright. Toothpicks and blue painters tape were used to make little flags. To move the boats, I used a "powerhead", a small submersible pump used for under-gravel filters in aquariums. I didn't need to submerse the pump, and simply drilled a hole at one of the 90 degree corners and used smaller diameter PVC pipe and JB weld quick set epoxy to connect it. I drilled a similar hole at the other corner to install an intake tube, and epoxied that in place as well. 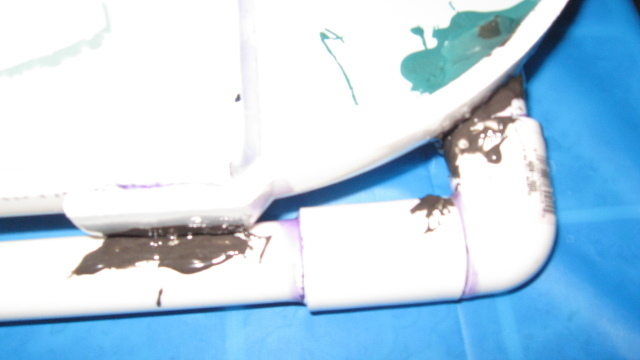 I also epoxied the intake tube to the outside of the aqueduct for stability. Keeping the pump outside the aqueduct was necessary since it was so large and would block the flow of water and the boats. The pump is powerful enough to circulate the water at a good rate. If the pump intake is not positioned low enough, air will get into the intake, so you have to position it as low as possible, and fill up the water as high as possible. 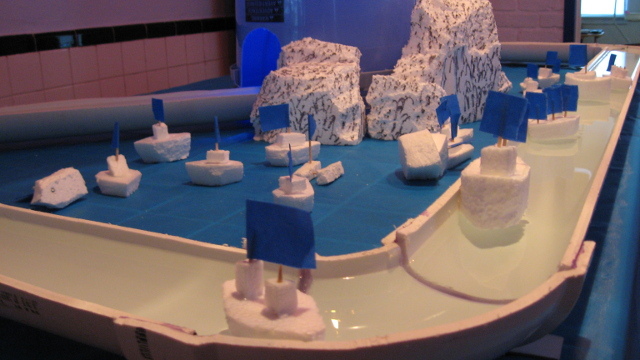 I had the water to the top edge, which required shimming the corners with cardboard to perfectly level the aqueducts.